The copyright and all rights are reserved for the Staffordshire Parish Registers Society, who informed me (23rd November 2000) that the indexed register was available in microfiche format from the Birmingham and Midland Society for Genealogy and Heraldry (Mr. M. Harrison, Publication Sales Officer, 121 Rowood Drive, Damson Wood, Solihull, West Midlands, B92 9LJ). As well as browsing the complete text, you can use my surname index to find all the entries mentioning a given surname, arranged in date sequence. Please note that the dates are those given in the contemporary source, and they have to be interpreted in the light of changing calendar conventions over the years. In case of difficulty, I recommend C.R. Cheney's Handbook of dates for students of English history, published by the Royal Historical Society, London, 1978. Also please note that the registers were not always conscientiously kept and that there are significant gaps in the surviving records. 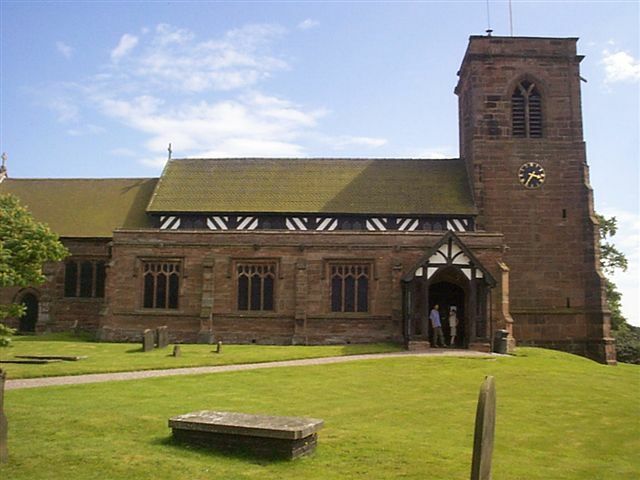 It may be possible to supplement the data in the parish registers by consulting copies of the registers, known as Bishops' Transcripts, held at Lichfield Record Office. Every effort has been made to ensure the accuracy of the present transcription, done by electronic scanning followed by careful manual checking of the OCR output, but even after many hours of painstaking proof-reading I cannot guarantee that the final result is totally error-free. Electronic sorting of the data has helped to reveal a few errors, but no doubt some may remain and I will be grateful if you will inform me of any cases of miscopying you find, so that they can be put right on this website. The authority for the validity of any data in this transcription is the 1916 publication itself, and ultimately, of course, the original registers held at the County Record Office in Stafford.